Are you getting unknown E-mails from unknown mailing lists then I think that you are in need of some free account for Sign Ups at various sites.Yopmail offers free service for temporary email storage.YopMail is a temporary Web Mail service (also called disposable email) allowing to Check anonymously all e-mail addresses like “@yopmail.com”. You can’t send anonymous email whith yopmail. There are many other services of this kind but I mentioned this one because, it also provides firefox extension in which you can just type the temporary e-mail address and log in to account. 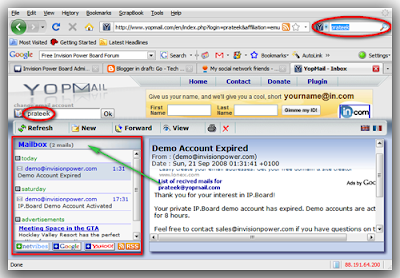 YopMail does’nt allow to send anonymous email. You can only send an anonymous email to a yopmail address.